Binding: Hard Cover Breitling. One watch has made this name famous worldwide, the Navitimer. In 1952 this watch was a real sensation, the chronograph along with the calculator made it possible for the pilot to carry out all necessary calculations during the flight. This made the Navitimer a valuable on-board instrument at that time, and a valuable collectible today. This newly revised book shows the whole spectrum of the firms products since its founding in 1884, and gives the reader an informed insight into more than 100 years of the firms history. Many photos, old catalogues, and advertising material support the informative text. 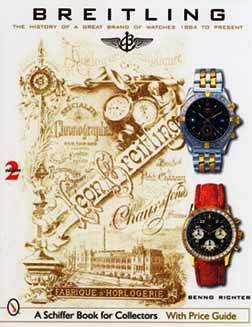 With the help of reference numbers, the collector can also locate individual watches chronologically. This fascinating portrait of the Breitling firm will enthrall all who appreciate fine mechanical precision.